Although I love this painting, I’ll try to be as objective as possible. The Swiss artist Arnold Böcklin studies in Germany, where he becomes friend with Ludwig Feuerbach, one of the most important philosophers of the 19th century. However, the Arnold’s heart, as it seems, was in Italy. With 30 trips to the country, the artist finally decides to live there for 10 years uninterruptedly. Is in Rome where Böcklin studies the classical artista and Roman mythology. This experience in Italy transforms Böcklin’s work and slowly will turn in a work full of symbols, fantastic worlds and mythical creatures. 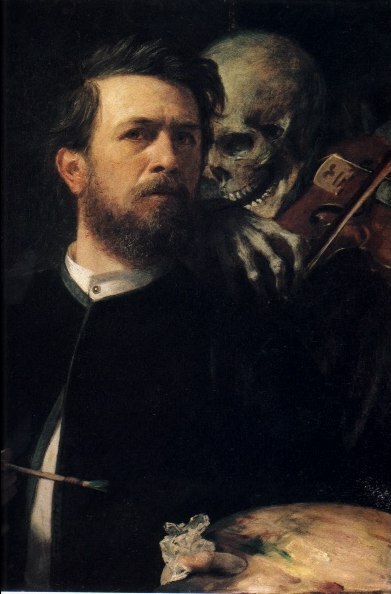 After the period in Italy, the artist comes back to Germany and paints Self portrait with Death playing the fiddle. Here we see the artist untidy, with a long beard and a neckless shirt. Behind him, in shadows, we see a skeleton playing a violin, a symbol used for centuries to represent Death. With a maniac grimace, Death seems to laugh sarcastically, foreseeing the inevitable fate of the artist and of as all. Since the death of his young daughter, it is said that the artist became obsessed by the idea of death. And having this in mind, we cannot be surprised that his two major paintings are named Self portrait with Death playing the fiddle and The island of death, the last one, a painting we’ll work on another post. ~ by Álvaro Mazzino on November 29, 2010. On va vous dire que ce n’est nullement erroné !! This entry was posted on November 29, 2010 at 09:18 and is filed under Symbolism.You can follow any responses to this entry through the RSS 2.0 feed.You can leave a response, or trackback from your own site.